This week was Rosh Hashanah; New York’s official “I’m super sorry” holiday. Everywhere you go, people are apologizing (or arguing about apologizing). My dry cleaner apologized to me. I don’t even know what for. A sweater? And you’ll hear men in yarmulkes kvetching, “I take that apology as a personal insult… a personal insult, I tell you!” The women’s apologies are more like an extra-aggravated form of grousing. Then, there are those who walk around with a look of perpetual shame. That would be me. I have lost my mind. I’m not sure where I put it. It’s probably somewhere in the smelly pile of laundry I call my life. I am not the most organized person. The other day I lost a cheese in my house. It was a stinky one from Zabar’s, so I suspect it won’t stay lost for long. I was distracted when I lost my mind (and the cheese) because I was being sued. I was being sued, not by 1 group–but by 4–all at once. First time ever. I’ll spare you the gory details, but suffice it to say I was haunted by visions of being locked up in some Dickensian debtor’s prison, eating nondescript gruel out of a miniature wooden salad bowl. I had a moment there. But now, I only have one person suing me. It’s awesome. No one sets out to be a Dickensian destitute. No one. He and his friends are pooling all of their money to buy an old U-haul trailer. He leans toward me. 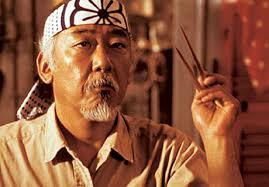 He is like a black Mr. Miyagi … full of wisdom and subtle decrepitude. And I’m about to laugh, when out of nowhere, a slice of pizza whizzes past my head. Black Mr. Myagi perks up. He is thrilled that someone is throwing pizza his way, but when I turn around to this seemingly charitable pizza hurler, she is the most disdainful, begrudging woman I have ever seen. And I think, who on earth would be mean to or dismissive of black Mr. Myagi? Doesn’t the very fact that he is homeless suggest that a number of people have already been mean to him? He’s sweet and flawed, and America does not take care of its seniors, which is terrible beyond measure. We should be apologizing. And why shove pizza in his general direction if it clearly irritates you??? Why be so disingenuous when you have a chance to be generous? What is that? As I mentioned before, I lost my mind this week. In its place was the head-spinning demonic kid from The Exorcist. It was a bad, bad night after the pizza moment, and I have a lot of sorrying to do between now and Yom Kippur (the other holiday where you fast and think about all the ways you’re guilty and feel like doody) but I’m down with it. No soap box. I am so down with sorry.